Now that I’m back in the states again, it’s great to be able to attend the Northeast Astronomy Forum in Suffern, NY. There are lectures and solar observing, but for me the main attraction is the exhibit floor. This is where you can see the scope, mount, or whatever that you’ve always wanted, in person. For scopes, Celestron, Meade, and TeleVue were there with big booths, but it was great to see that Explore Scientific had a booth to match (and probably with more scopes, including some awesome refractors in the 152-165 mm range). Takahashi had a small booth, as did William Optics. AstroPhysics had a good size booth with lots of glass to look at. Omegon had some scopes on display too. For cameras, Atik, QSI, FLI, QHY, and ZWO were all there. QHY had examples of their high-end scientific cameras, including the much-talked-about QHY600, which he said would be priced at “over $8000” when released. There was a medium format scientific camera that was “over $50,000” if that’s not a big enough chip for your needs! One hot item seemed to be Omegon’s new MiniTrack LX2, a mechanical (wind-up) travel mount for wide-field AP; like the AstroTrac, but much smaller (and cheaper, with a NEAF special price of $115). I thought a cool innovation it had was to use adjustable tension instead of counterweights. There were only a few retailers there, but Highpoint Scientific and Woodland Hills had lots for sale. Some of the non-US vendors couldn’t sell direct, but were giving out coupons to use online or with the vendors on-site. So did I find some goodies to lust after? Absolutely. I decided that maybe a 140 mm refractor could just be handled by my mount, and I really liked the Explore Scientific carbon fiber FPL-53 triplet they had on display. I also found that the William Optics RedCat was a bit bigger than I expected a 51 mm to be, and not much smaller than my Star71, though the FLT132 behind it looked pretty nice. Overall, it was great to be there and see the people of this hobby in person, rather than just online. (Does amateur astronomy still skew white, male, and older? Yes. But it does seem to be getting better.) I love that there are new manufacturers coming into the astrophotography space and shaking things up a little. There was definitely more of a focus on AP than visual, or maybe that’s because that’s what I was looking for. NEAF is always worth it, and 2019 was no exception. 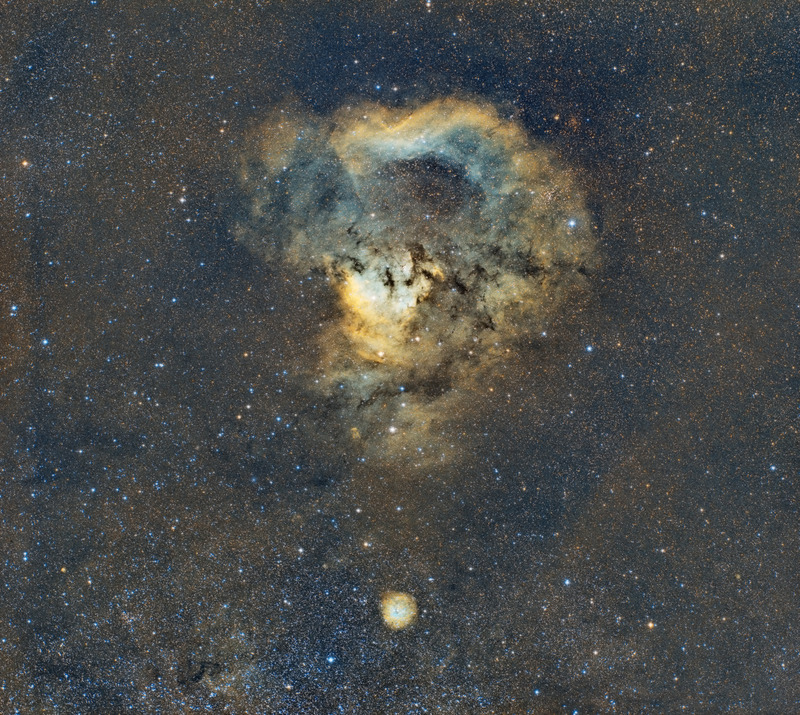 For an incomplete project I’ve been working on, I matched up Barnard’s Atlas of Selected Regions of the Milky Way with my own widefield image of the NGC7000 area. 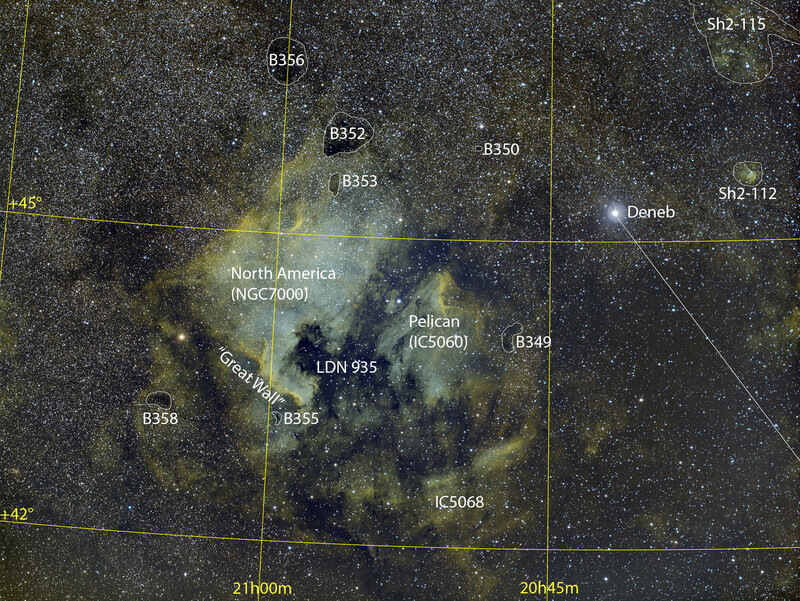 In case you’ve ever wondered about the designations of the dark nebulae around the North America Nebula, here they are! 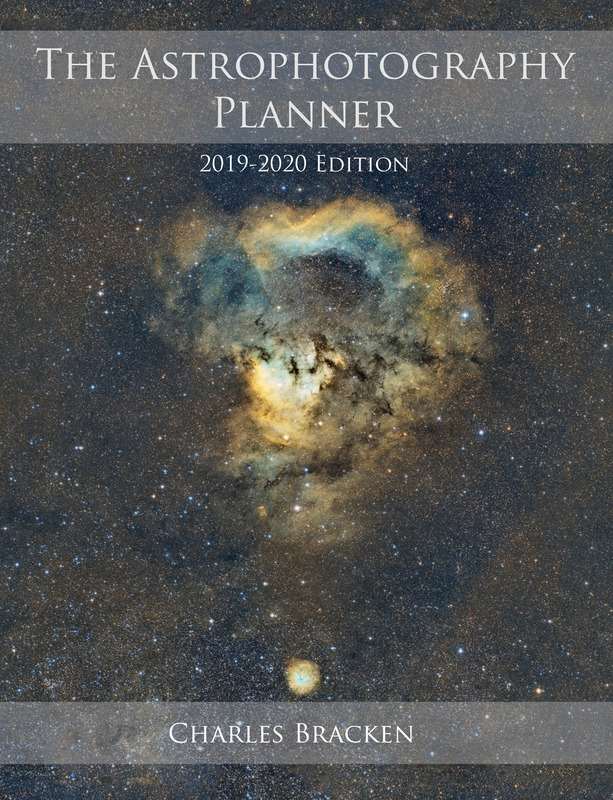 I find it odd that he didn’t catalog the “Gulf of Mexico,” but when you look at his plates, what we now call the Pelican Nebula isn’t as bright, so the Gulf doesn’t look as distinct. It was subsequently picked up in Lynd’s catalog as LDN 935. After reading about it on the CloudyNights forums for a while, I decided to get a camera based on the Panasonic CMOS sensor. While they are not any more sensitive than the KAF-8300, the resolution and low read noise were appealing* for narrowband imaging. I bought a used ZWO ASI1600MM Pro, and I was very pleased with the price, the accessories, and the build quality. This image is first light with that camera. It is also first light with my new NUC at-the-mount computer, which is one of those “why didn’t I do this sooner?” kind of upgrades. As you can see from the image below, imaging at f/2 is a joy with the Samyang, and the sharpness is impressive. The C.Q.M. is actually several objects, but framed together, they do indeed look like a question mark. NGC7822 is at the top, though it’s really just the star cluster. 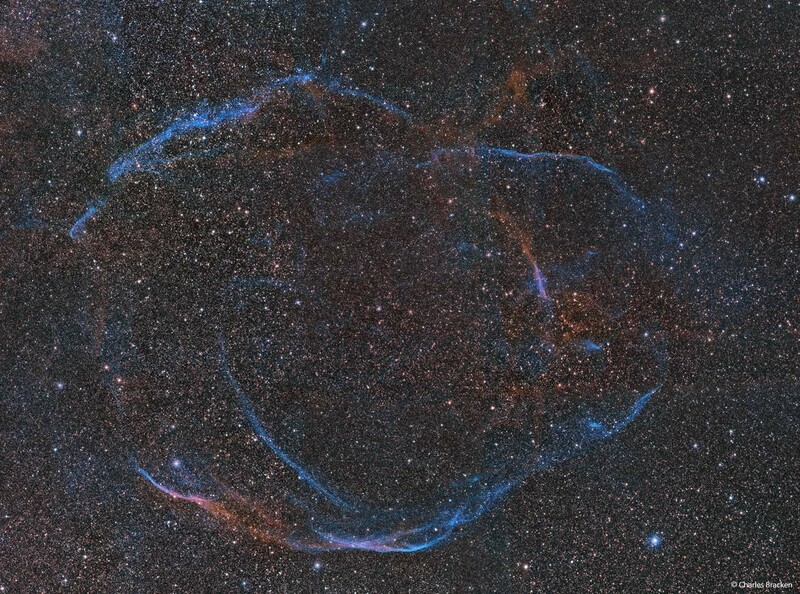 The whole nebulosity that forms the top of the question mark is cataloged as Sh2-171. 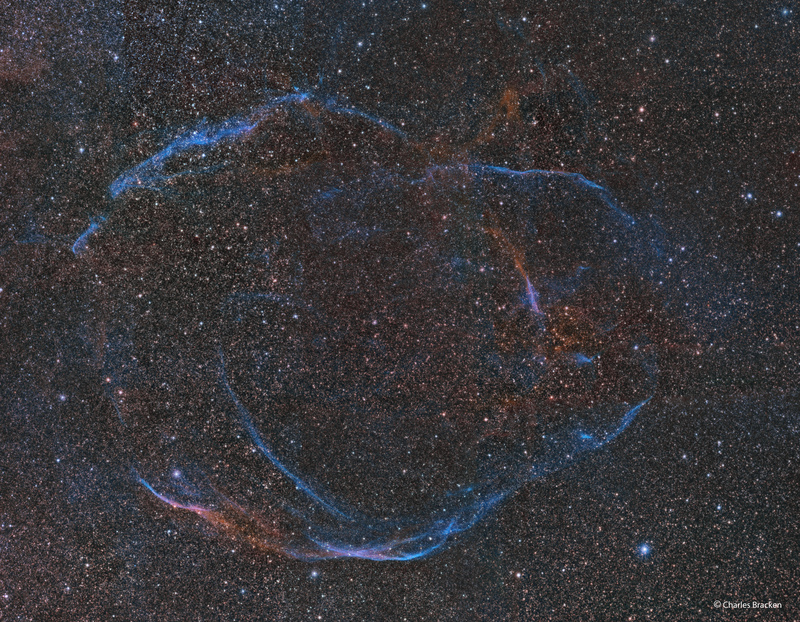 The bright part in the middle is specifically cataloged as Ced 214. The ‘dot’ of the question mark is Sh2-170. The small cluster at the top right, just outside of the question mark is King 11. The larger cluster in the same area, but just inside the nebulosity is NGC7762. Click on the image for a full resolution version. After two years in the UK, I’m living in the US again, and more importantly, imaging again. I don’t know how the UK imagers do it: I didn’t get a chance once in my two years there to set up. I made the mistake of introducing too many new variables on my first night back out. A new NUC computer is controlling things now, and I was trying new software, APT, for the first time. So of course things went wrong. It’s a shame, because the alignment I was trying to catch only existed for about 2 hours. 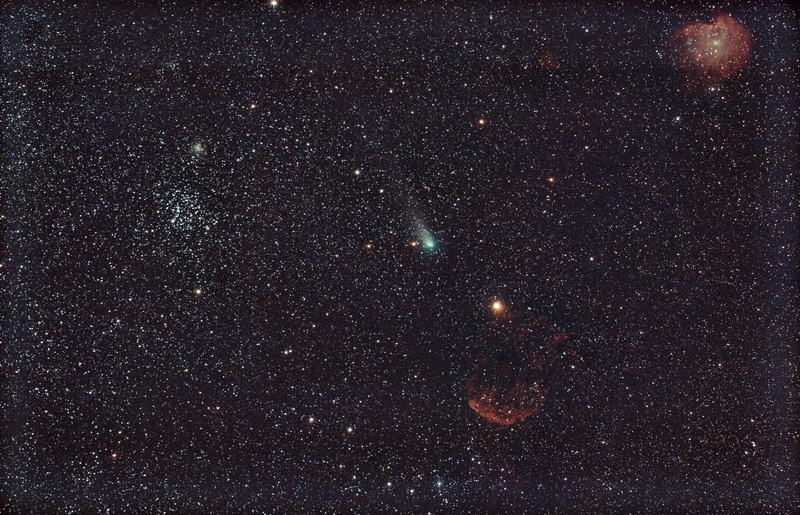 Comet 21P/Giacobini–Zinner would be passing right through a triangle of objects that consisted of M35, IC443 (the Jellyfish Nebula), and Sh2-252 (the Monkey Head Nebula). Long story short, I got 3 4-minute exposures before the mount refused to track anymore. I was so despondent, I didn’t take any flats or darks, so this is a pretty raw process, but for what it’s worth, here’s what I got. Oh, the image this could have been with more time… I hope someone out there captured this alignment better than I did. 3 4-minute exposures. Modified Canon 6D, William Optics Star71, Takahashi EM-200. Complete coverage of PixInsight® has been added, with workflows for both PixInsight and Photoshop®. There are also two new start-to-finish processing examples. 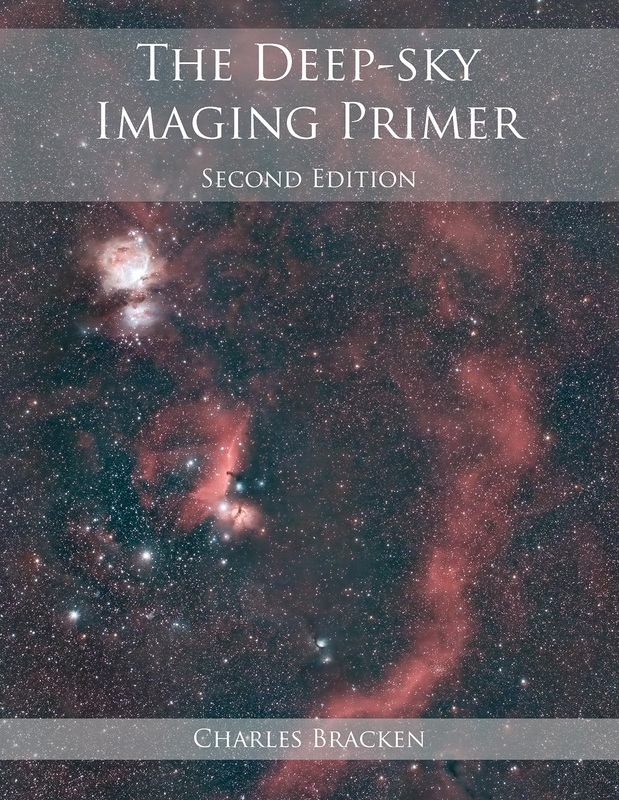 The early chapters have been revised, with clearer explanations of important topics like noise and resolution. 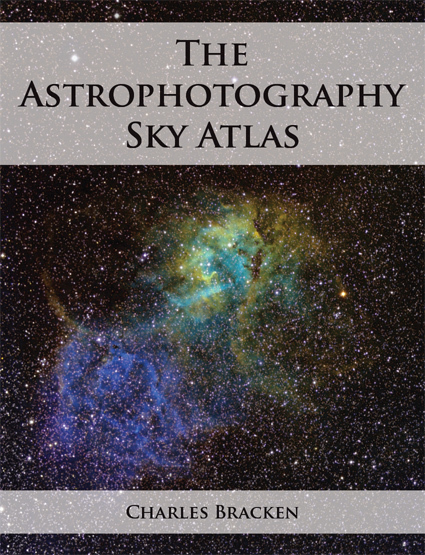 And a new appendix provides details of the best imaging targets for northern hemisphere imagers. Overall, it’s a bigger, more readable book, with a lot more content. Click here or the image below to order the book from Amazon.